Sunday has always been rest and meal prep day for me. I give my muscles a much needed day off to recharge for an upcoming weak of crazy, intense workouts, because I never do a moderate workout. Being a busy career mom of 2, I only have 1 hour a day to workout and shower. Therefore, I choose intense workouts (Basically, Insanity or any other crazy Shaun T workout) that are 30 to 45 minutes tops. They do the trick beautifully, and I find myself swimming in a pool of my own sweat afterwards (Yeah, I know you might think to yourself “Ewww, that’s gross”. I don’t blame you, but as long as my fat is crying, I’m a happy gal). So on Sundays, I rest, and I prep for an upcoming week of healthy eating and exercising. Today, I kinda “forced” myself not to workout. My body felt like it was lacking something; I had so much energy and was feeling the urge to break a sweat but I decided to just chill out all day. Then I started meal prepping lightly: boiling eggs, broccoli and green beans, grating carrots, and baking a healthy stack of muffins to munch on as a snack throughout the next week. 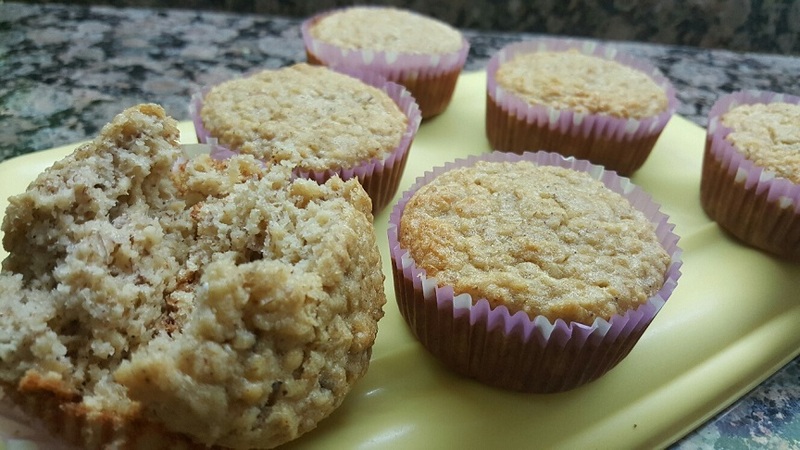 They turned out to be more like a banana bread muffin as they were very low in carbs and fat. 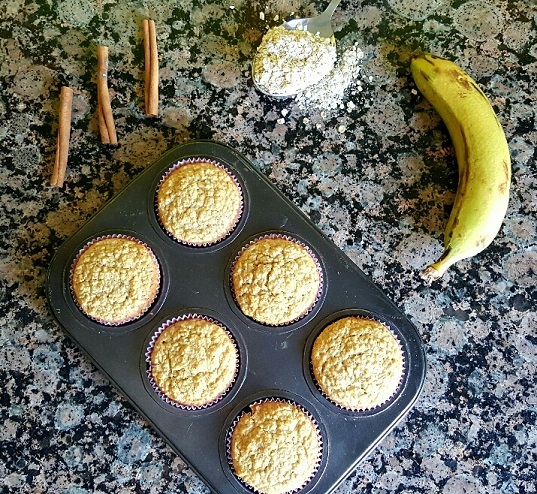 I’m on a calorie count journey for the next couple of months so these muffins will be just awesome! 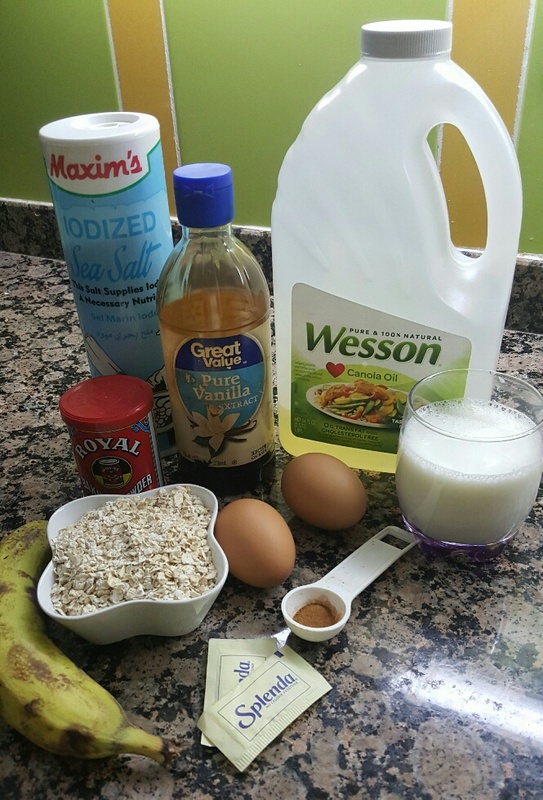 In a bowl, whisk together eggs, oil, Splenda, vanilla extract, cinnamon and salt. Add in the mashed banana and milk and whisk well. Next, add the oats in 2 batches, whisking well after each batch. Add the semolina to give it some body, and finish by whisking in the baking powder. 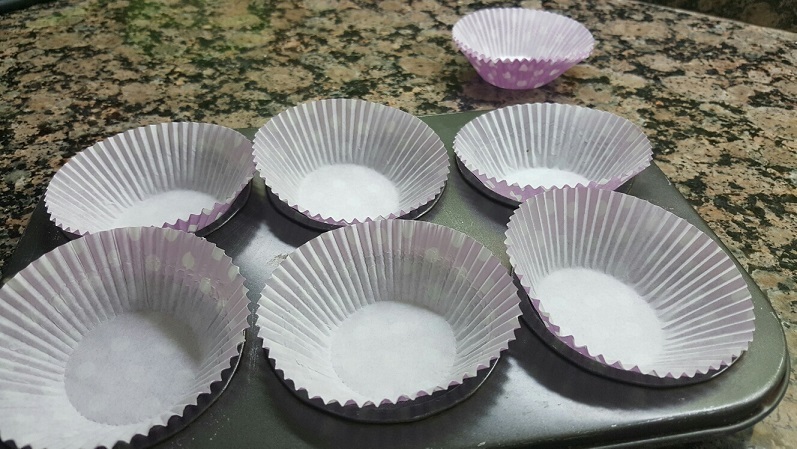 Line a muffin tin with paper cups and pour 1 ladle into each muffin. The batter will be enough to make 10 muffins. Bake for 20 to 25 minutes in a preheated oven at 180 degrees C (or until a toothpick inserted comes out clean).